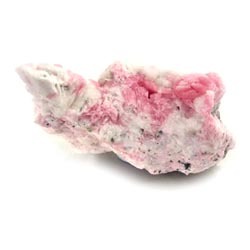 Rhodochrosite is at the top of the list when you think of Colorado minerals. It is the Colorado state mineral. The most beautiful specimens in the world come from the Sweet Home Mine that is located in Alma, Colorado. Now closed, this mine produced large beautiful specimens for about 10 years in the 1990’s. While specimens from the Sweet Home are still available, they are increasingly rare and the price continues to rise. For the collector of minerals, the price is well worth it for the Colorado beauties. Colorado "rhodo" is the bright red, crystal clear variety unlike all but one other rhodo location in the world. Interestingly, the other location for this sort of clear cherry red crystal is the Pasto Bueno mining district, located in Peru. Like the Sweet Home Mine this district is at timberline, but is a continent away. 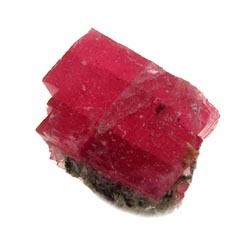 A Description Rhodochrosite is a manganese carbonate mineral. Its chemical composition is MnCO3. In its purest form it is a transparent rose red, but this is fairly rare. It can also be formed in stalactites. This form can be sliced revealing circular layers of rose and pink to milky white. These lighter colors are formed when the manganese is replaced by calcium, manganese or zinc. The depth of color from red to pink depends on the amount of substitution. This mineral has a Mohs harness scale between 3.5 and 4 and its streak is white. Its crystal formation is rhombohedral, meaning it is like a cube, but “squished” to form and equal-sided parallogram or rhombus shape on its sides. It cleaves perfectly along each of the three planes that form the rhombohedral shape. This mineral is prized by mineral collectors. It is also popular in jewelry.